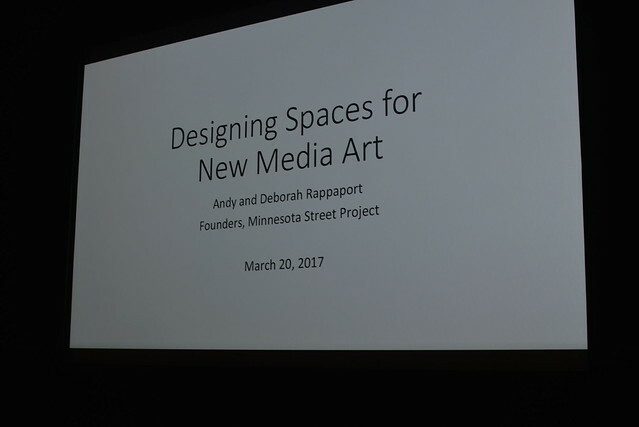 On Monday, March 20th, Andy and Deborah Rappaport, founders of the Minnesota Street Project, which houses affordable spaces for artists and non-profits, shared the pleasures and challenges of collecting art objects in this digital age. Their conversation, titled “Designing Spaces for New Media Art” and held at BAMPFA, highlighted their deep commitment to increasing art’s accessibility. Questions raised throughout the program centered around how they’ve built a new media infrastructure to house their collection, which all began with Christian Marclay’s “Guitar Drag” (2000). Conserving their media art hasn’t been easy, they shared. Complications arise when particular monitors become obsolete (“No piece of technology lasts forever,” Deborah said), installation instructions are made for art museums instead of homes, and the works themselves incorporate different mediums of ranging complexity for display. Check out the photos and highlights below!